Given my past record, I suppose I should’ve known better than to think I’d able to keep up a next-day diary during all of Toronto Beer Week. It went well enough for day 1, but then – well, it’s now two and a half weeks later, and I’m just getting to day 2. Hardly seems worth it given that everyone else has finished writing about the whole week and have moved on to other things, but I’m not gonna let all the goddamn photos and notes I took go to waste! 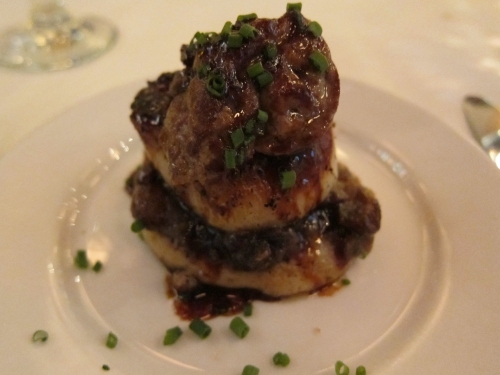 Astute readers will notice that this dish shares some elements with the waffle course served at the Dieu du Diel! 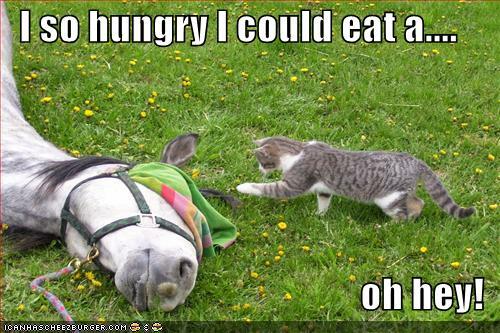 brunch a couple of days earlier. But considering that those shared elements include melt-in-the-mouth foie gras and a mindblowing chocolate veal jus, I wasn’t complaining. Despite looking a bit of a mess, this was a delicious and decadent start to the meal, and the crisp beer did a great job cutting through the richness and sweetness of the dish. 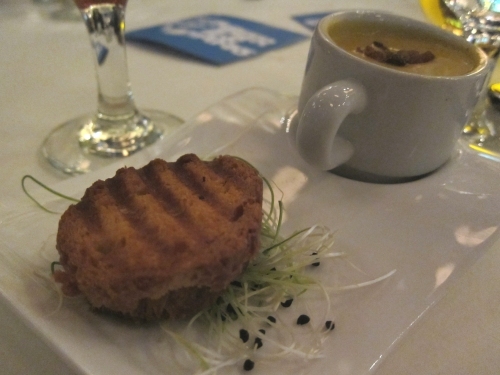 Chef Brian Morin has served a mini-soup-and-sandwich course at almost every beerbistro beer dinner I’ve attended. Maybe he just digs the little plate and cup that’s used to serve them? Whatever the reason, this was an especially nice one – the soup was loaded with so much aged cheddar that it was more cheese soup than squash, and the cheese and bacon sandwich was, well, a cheese and bacon sandwich – i.e. awesome. A nice pairing with the well-hopped but not too bitter 5AM Saint. Have I mentioned lately that beerbistro beer dinners are not suitable for people on diets? 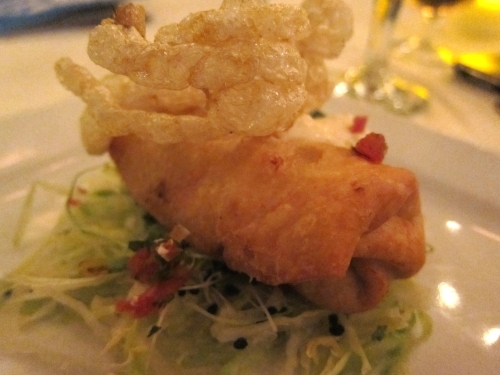 In case not, here’s a reminder – a deep-fried rabbit chimichanga with cheese, sour cream, and a fried pork rind. Oofah! It had a good spice kick as well, which the wonderfully hoppy Punk IPA held up against nicely. Now, unlike some people, I don’t have any great objection to the idea of eating horse meat, but I did have an objection to this specific dish: it was very dry and not as tender as a slow braised meat should be. I spoke to chef Morin afterward, and he said that he wasn’t happy with the way it turned out either, and chalked it up to receiving and using a different cut than what he’d originally hoped. Slightly tough meat aside, though, it still had great flavour, and the sides really held up their end of the bargain as well. As for the pairing, I must confess that my notes started to get a bit sketchy around this point of the evening, as they inevitably do, so I can’t offer much more than to say I recall enjoying it. 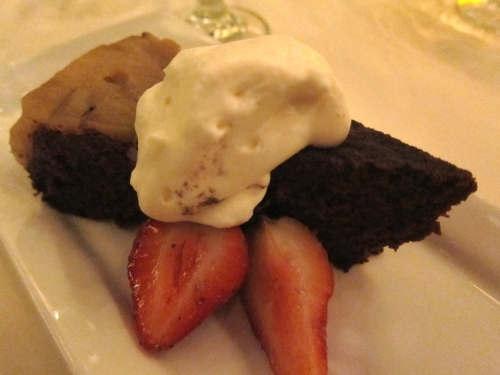 To finish dinner, what’s better than one dessert paired with one imperial stout? How about two desserts paired with two imperial stouts! 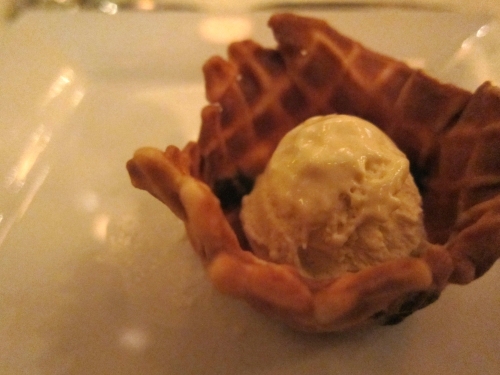 The first was almost a dessert appetizer – a small scoop of ice cream in a tiny bacon-flavoured tuille shell. This was perfectly matched with the Isle of Arran edition of Paradox, BrewDog’s series of imperial stouts aged in whisky barrels, with the vanilla and mocha notes in the beer meshing well with the ice cream. Then a real treat, as we were given the honour of being the first folks outside of the brewery to try the latest in the Abstrakt series of experimental one-off beers. Code named AB:04, it’s a luscious stout brewed with coffee, cocoa and Naga chilies – or rather chili, as only a single one of them was used in the batch, and as they’re considered the hottest chili in the world, it was enough to give the beer a nice mellow burn towards the back of the throat. The cake was fine as well, but it was the beer that got most of my attention. 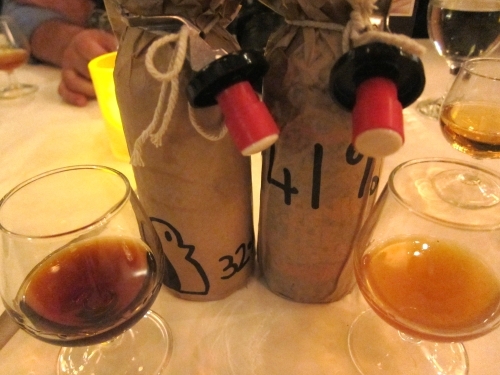 Finally, a hotly anticipated pair of nightcaps, and two previous record holders of the Strongest Beer in the World title – Tactical Nuclear Penguin and Sink The Bismarck. Josh described it as a “hop liqueur”, and that pretty much nails it. 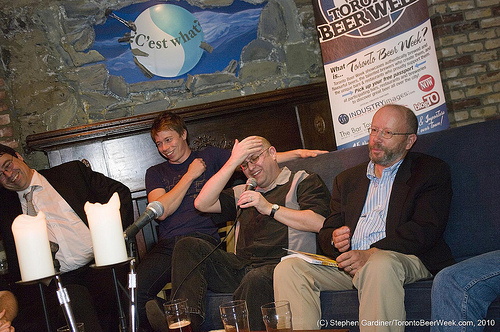 Last but not least, it needs to be mentioned that Watt was a fantastic host who shared lots of great info and anecdotes about BrewDog and its brands, and even taught us how to talk to our beer the Scottish way. Generally, I think it went down pretty well. The turn-out was decent enough, especially for 10 PM on a weeknight, and no-one threw anything at us, which is always a good sign. Jordan over at St. John’s Wort offered a bit of criticism, raising some points that George might want to consider if he brings it (or something similar) back for next year’s TBW. And he singled out my mini-rant about the complete awfulness of Wellington Silver Wheat Ale as one of the highlights of the night, so he’s obviously a man of great intelligence and good judgment. 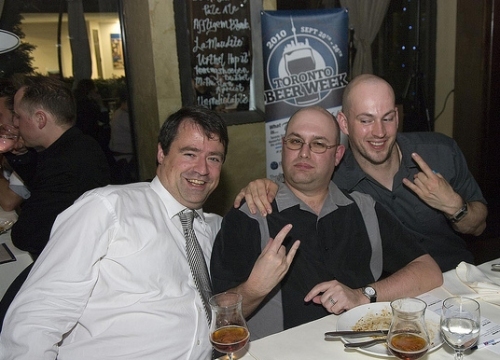 This entry was posted in beer dinners, beer people and tagged Toronto Beer Week. Bookmark the permalink. Hey, Clow. Do you have that girl’s number?